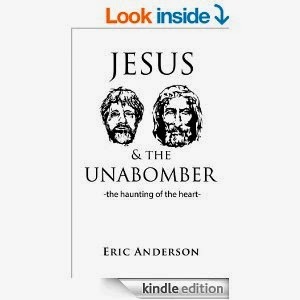 If you like thought-provoking literature, Eric Anderson's "Jesus & the Unabomber: -the haunting of the heart-" is for you. The essay is a fascinating look at similar traumatic incidents in the lives of Jesus Christ and Ted Kaczynsk that ultimately helped them develop similar philosophies. Anderson organizes the evidence in a way that is easy to follow. He uses direct quotes from the Biblical Gospel and Kaczynsk's "Industrial Society and Its Future." The similarities he uncovers are striking -- for instance, Jesus' use of the Holy Spirit (The Muse) is in essence the same as Kacyznsk's "power process." Anderson argues that Jesus' circumcision as an infant had a strong impact on his philosophy and lessons. Although this essay is not wordy, it contains lots of thought-provoking information. Whether you're a spiritual person or not, this book will have you asking lots of questions.